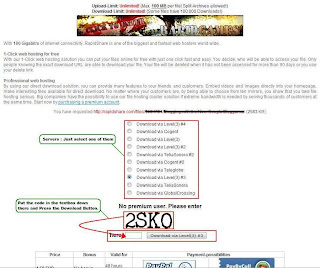 COMPUTER & INTERNET TIPS+TRICKS & SOFTWARE COMPUTER & INTERNET TIPS+TRICKS & SOFTWARE: (Tutorial) How to download a file from Rapidshare? 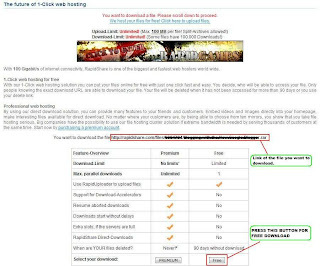 (Tutorial) How to download a file from Rapidshare? Let's get straight to the point. I am assuming you are a nOOb and you don't know anything. Step 1: You have just found a Rapidshare Link. Click on it. It would take you to a page like this. Step 2: See that free button over there ? Click on it. Step 3: After pressing that button, you would come to a page like this. Just Select a server, and put the code in that text field. Step 4: After pressing the "DOWNLOAD" you should get an option to "open" or "save". You should "SAVE THE FILE" on your hard drive.